The Junior League of Sacramento will be taking part in Big Day of Giving and needs your support. 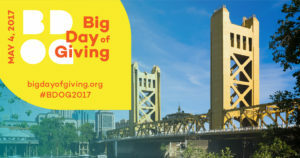 From midnight to midnight on May 4, 2017, the Sacramento Region Community Foundation will coordinate the fourth annual Big Day of Giving (Big DOG). Big DOG is a local initiative to increase philanthropy in the Greater Sacramento Region, providing community supporters 24 Hours to give where your heart is. In 2016, the Big Day of Giving raised over $7 Million for local non-profits. The Junior League of Sacramento raised $6,610.96 for the Annual Fund and the Endowment. This year the Junior League of Sacramento has a goal of raising $10,000 in donations. The largest number of unique donors between 5 am and 6 am on May 4th; Prize is $1,000. The Junior League of Sacramento will be providing many updates through social media (Facebook and Twitter) over the coming weeks. Please be sure to follow us to receive regular updates. We look forward to your support on May 4th. Donations should be made at www.bigdayofgiving.org/JLSac. Thank you for helping to drive our new mission and helping JLS move into our biggest year yet- our 75th anniversary! If you have any questions please contact Sara Martinez, Fund Development Chair at saracarlina@gmail.com.